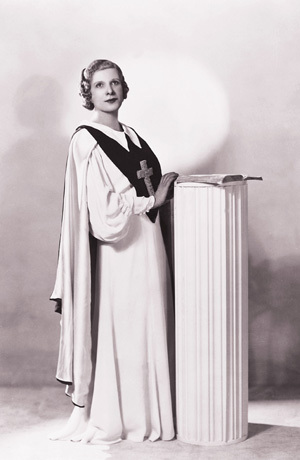 Aimee Semple McPherson was a famous evangelist from the early Twentieth century who founded The Foursquare Church. The way she lived her life was charitable, controversial, and contradictory. McPherson's background and life was all about helping people beginning with watching her mother work with the Salvation Army. She believed strongly that faith and helping people goes together though works alone won't get you into heaven. The permanent home of The Foursquare Church, Angelus Temple in Los Angeles, was was founded out of McPherson's desire to settle in one place and curtail her traveling. In addition to the church building, McPherson was granted a broadcast license in 1924 for a radio station, KFSG (now KTLK), owned by The Foursquare Church. Aimee McPherson died in 1944 leaving behind a legacy of good works, a church, and many unanswered questions.